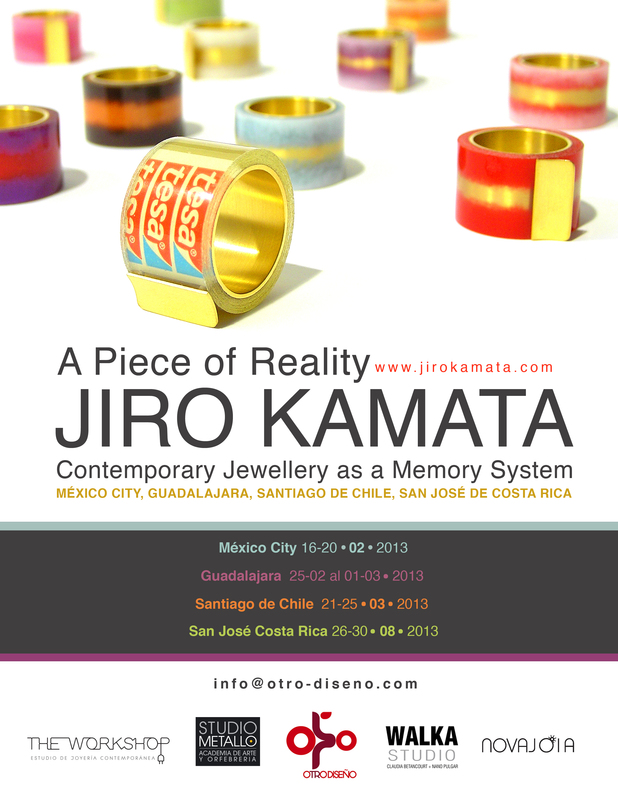 The Otro Diseño Foundation (y la sede local) invite(s) to the workshop ‘A Piece of Reality: Contemporary Jewellery as a Memory System’, dictated by the Japanese artist Jiro Kamata. ‘A Piece of Reality’ is the second workshop in the series ‘Travelling Workshop’, an initiative of Otro Diseño Mexico, Walka Studio Chile and NovaJoia Brazil, which aims to offer jewelers, designers and visual artists who live in Latin America the opportunity to address the global notion of contemporary jewellery by the exploration of conceptual and critical thinking and the application of materials, techniques and technology according as a response to that line of thought. The program seeks to offer jewelers of this cultural region the tools to define their individual position as an artist, strengthen their respective national scenes and participate actively in the international arena of contemporary jewellery. Jewelry, through history, has functioned as a memento, capable of safeguarding through time events relevant to an individual or community. ‘A Piece or Reality’ addresses the role of contemporary jewellery as a memorial object and its appropriation of portable recording technology. During the workshop Jiro Kamata will use his iconic ‘Tesa Ring’ as a starting point to analyze the relationship between concepts, materials and techniques and encourage participants to explore the creative potential of jewelry as a powerful tool of social communication. Jiro Kamata was born in Hirosaki, Japan. He studied jewellery at the Yamanashi Institute in Kofu and became later a student of Otto Künzli at the Fine Arts Academy in Munchen, city where he lives and works since 2000. Jiro Kamata is an assistant professor at the Fine Arts Academy in Munchen. His work is featured in exhibitions around the world and in private and public collections such as the V&A Museum in London, the Stedelijk Museum in Amsterdam or the Hiko Mizuno Collection in Tokyo.